The hammer crusher is a crushing crusher that directly crushes materials with a maximum particle size of 600-1800 mm to below 25 mm or 25 mm. Hammer crusher consists of box, rotor, hammerhead, counterattack liner, sieve plate and other components. Hammer crusher can be used for crushing limestone, calcite and barite, talc, gypsum and other materials. 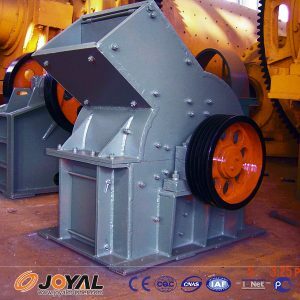 Shanghai Joyal Mining Machinery here mainly talks about the importance of hammer crusher’s spindle to hammer crusher. Hammer crusher is widely used due to its simple structure, low cost, large crushing ratio, good product particles and light weight of equipment, etc. The main components of the rotor are spindle, disc, pin and hammer. The motor of the hammer crusher drives the rotor at high speed in the crushing chamber. The ore and other materials are fed into the airframe from the upper feed port and are crushed by the impact, impact, shearing and grinding action of the high-speed moving hammer. As the main part of the hammer crusher, the main shaft is the key component of the hammer crusher, which requires both high precision and high rigidity. Joyal reminded everyone that due to the non-uniform force applied during the machining, installation and operation of the spindle, the spindle is subjected to eccentric forces during the rotation process, gradually forming microscopic cracks and gradually expanding at locations where the stress is particularly high, resulting in sudden brittle fracture. In addition, we must pay attention to the work of the hammer crusher rotor, the role of the load on the rotor components are dynamic loads, when the force frequency and the structure of some natural frequency close to the hammer crusher spindle will have a strong resonance, Causes damage or excessive deformation. Therefore, the crusher spindle is required to have high static and dynamic characteristics. How to do after the jaw crusher spindle wears?